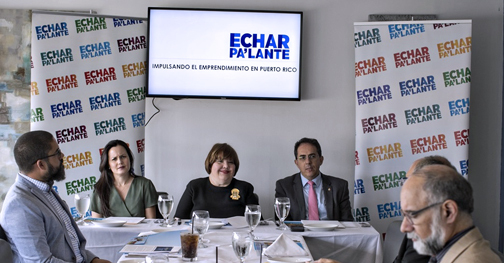 From left: Beatriz Polhamus, of Banco Popular's Social Commitment division; Gloria Viscasillas; and Eduardo Negrón, executive vice president of the bank's management team discuss Echar Pa'lante's achievements and future plans. From left: Beatriz Polhamus, of Banco Popular’s Social Commitment division; Gloria Viscasillas; and Eduardo Negrón, executive vice president of the bank’s management team discuss Echar Pa’lante’s achievements and future plans. Echar Pa’lante, an initiative Banco Popular launched five years ago to empower a culture of entrepreneurship and innovation, is looking ahead to further linking academia, the government and the private sector to help restore Puerto Rico’s economy. The multisectoral alliance has more than 2,000 partners from all sectors and regions committed to Puerto Rico’s wellbeing and progress, said Gloria Viscasillas, head of the Echar Pa’lante program and vice president of Banco Popular’s Economic Development programs. “Through the evolution of the movement, we have been convinced time and again that education and the development of an entrepreneurial mindset are essential tools for achieving progress in our society,” she said, of the initiative launched in 2012. With the collaboration of its partners, the multisectoral alliance has drawn up a four-pronged path to follow toward expanding entrepreneurship on the island, especially among students and teachers. Echar Pa’lante seeks to: Coordinate multisectoral alignment that accelerates and promotes transformative action; Re-train the human capital needed to develop, implement and sustain systems that encourage entrepreneurship; Transform the content of education to develop competitive entrepreneurial citizens; and integrate and strengthen the support ecosystem for entrepreneurs. Part of the process calls for educating 800 teachers on the entrepreneurship skills that they can in turn impart on students starting in middle school and higher, Viscasillas said. The alliance is already working with the Department of Education, as well as all local universities, to design curricula to create a future generation of entrepreneurs. “Education is the main tool to develop an entrepreneurial culture in the island,” said Francisco Montalvo, coordinator of the Puerto Rico Private Sector Coalition, a partner of the Echar Pa’lante movement. “That’s why it is essential to train school directors, teachers and university professors to establish systems that encourage entrepreneurship in children, youth and adults,” Viscasillas added. Through partnerships with Babson College, Entrepreneurship Learning Initiative and Georgia Tech (among others), the multisectoral alliance has been able to train more than 1,000 teachers and school principals and more than 300 university professors in entrepreneurship and innovation best practices. Echar Pa’lante is betting on an army of educators to integrate entrepreneurship and education, said Javier Hernández, director of the School of Business Administration at Sacred Heart University. In the first months of this year, the alliance has been been working to develop maps that will guide the multisectoral efforts for the development of entrepreneurship and business education ecosystems in the next three to five years, Viscasillas said. “We have the commitment of both the government sector and private companies to implement these collaboration plans to serve as a great stimulus to the venture and to begin to see significant growth of the sector and its impact on economic development on the island,” she added. Hey Buddy!, I found this information for you: "Echar Pa’lante campaign marks 5 yrs. of empowerment". Here is the website link: https://newsismybusiness.com/palante-campaign-empowerment/. Thank you.